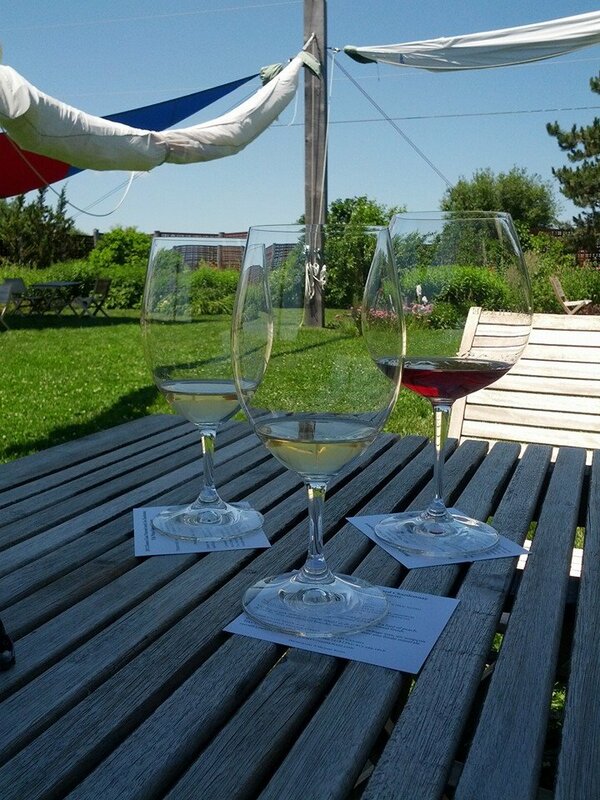 It’s been more than two years since we visited Prince Edward County, which was entirely too long. I almost forgot how much we love it there. The love came rushing back to me pretty much as soon as we arrived at Norman Hardie‘s for some tastings and wood-fired oven pizza. The food and wine, the fresh air and green fields, the County camaraderie…it’s starting to feel like home out there. After Hardie we hit stops from our previous trips, including Rosehall Run, The Old Third (where there was a chocolate lab puppy so cute I wanted to just eat her like candy), Closson Chase, Hinterland (where they fed us pulled pork sandwiches outside), and Lighthall. We also hit a few new ones like Hubbs Creek, Broken Stone, and Trail. Hubbs Creek was really good — nice Pinot Gris, decent Pinot Noir, and a very interesting Sussreserve Gamay rosé. We checked into our room at the Newsroom Suites, had a little nap (I’d sampled a lot of wine), and walked across the street for dinner at East & Main. It was, as always, terrific. Nellie had mushroom ravioli and the steak frites while I had the scallops and the duck special. Our server recommended a bottle of Karlo Estates Quintas to go with it, and it lived nicely indeed amongst our two mains. The next day I got up early for breakfast at The Tall Poppy while Nellie slept in. Soon we were on our way again, checking in at Huff Estates and and TerraCello for early-morning tastings. TerraCello was a new stop for us; we liked that they’re doing very different wines there, like a straight Vidal and a De Chaunac. They also do wood-fired pizzas, though they weren’t quite up and running yet that morning due to an overnight power outage. No problem though; we just skipped back over to Norm Hardie’s for round 2. Bumped into an old colleague while there too, which was a pleasant surprise.